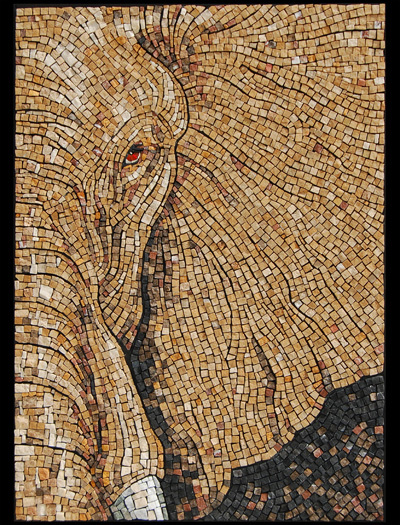 Selected for the "Mosaic Arts International Exhibition 2010"
Dimensions: 15.75 " x 22"
The inspiration for this piece was a PBS Nature documentary called "Unforgettable Elephants". In it, the photographer Martyn Colbeck shot video footage and still shots of a family of African elephants over the span of 15 years. I found this program not only moving and insightful, but it inspired me to capture in stone the beauty I saw in these gentle animals. The various textures of a mature elephant's skin was fascinating to me. I wanted to focus on this aspect, describing rough and smooth surfaces in a somewhat abstract composition. The overall impact though was still clearly to be elephant... almost too large for one frame. Various colors of white, tan, gold, brown and black marble were used. The source tiles' size variety made the contrast between the rough pieces of the trunk and the smooth, flat ear possible. The brow and forehead is where both kinds of surface meet, where the bone draws the skin taut. The flow pattern of the tiles was also used to help emphasize the surface shape as well as its texture. To add a touch of sparkle, I decided to use the beauty of Smalti glass to define the eye. A cover of long black lashes hoods his gaze.